Im trying to get my website verified by google webmaster tools , when i try it says it cannot be found and advises as ways to achieve this but I dont seem to be able to do what they advise could some one give me a walk through as i dont know how to upload to the website or paste the code, all options dont seem to work any help would be great,,cheers!!! Please can you paste your Google Webmaster metatag code here and the domain for which you're trying to verify? I can try to add this for you. Google says the analytics is in the wrong place, I've put in the top of the page as suggested and it seems to be tracking put only getting a couple of visits a day, is this wrong or Have I inserted it in the right place I'm total new to websites so any advice would be really appreciated. When you add the code, you only need to add this bit: spgTQR_ccRqW1w2UGJjDDBEkJOKQnRpE-B7rhtwi0pc in the Google Webmaster tracking area. Open your site in the Sitebuilder. 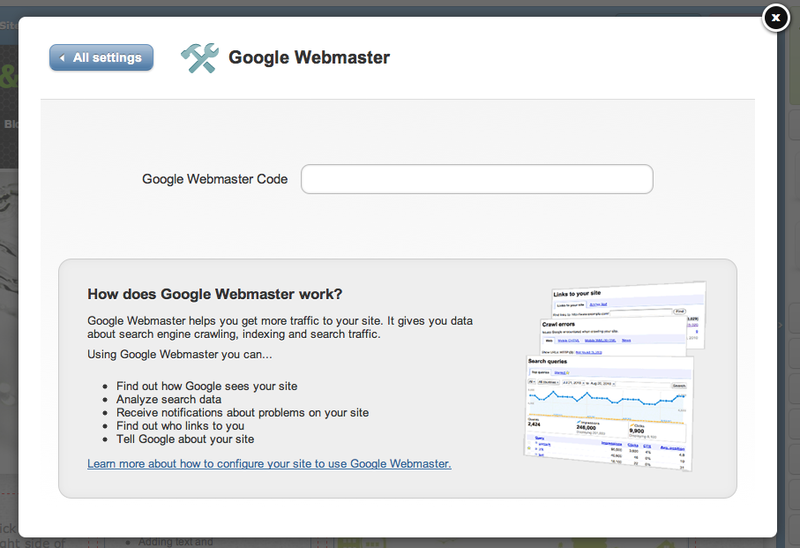 The Google Webmaster screen will open up. Paste the code into the field provided. See the screen shot below. Click on the X in the top right-hand corner to close the screen and return to your Sitebuilder. I hope this helps! Let us know if you need any further assistance.